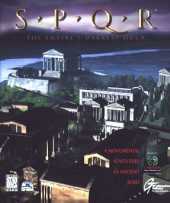 A point-and-click puzzle adventure in the style of Myst, SPQR pits you against the mysterious Calamitus, an anonymous enemy of the Empire who threatens its very existence in the year 205 A.D. You must uncover his identity before his machinations succeed in bringing down the state. Explore the streets, temples and secret labryinths of the Roman forum in your quest to save the emperor. The storyline - complete with drama, twists, cliffhangers and multiple endings - is a Roman "soap opera" crafted by television writers and historians. It's a challenging graphic adventure - original mind-bending puzzles utilize authentic historical artifacts and data. The root of the game is the original version, which was designed for multi-player use over the Internet in 1995. The game is obviously influenced profoundly by the history and peoples of ancient Rome. The aspect of investigating crimes against the city is as old as mankind's written history. You must journey to Rome and investigate five equally suspicious characters in an attempt to discover who is behind the havoc currently sweeping the city. A wave of panic, borne of treachery and murder, is washing across the Empire and threatening to topple mighty Rome. A seer, Sybil, has foreseen this trouble and foretold of a stranger, known only as Calamitus, who is at the core of the pervading unrest and destruction. A variety of on-screen icons (e.g., gazette, calendar, maps, architectural plans, compass, secret compartments, etc.) are provided to aid in the search for the perpetrator. You'll need full knowledge of how the ancient city works at all levels (economics, culture, politics, etc.) in order to ferret out the mysterious stranger behind the chaos. With the use of Cornelius's secret device, the Navitor, you'll need to become a virtual citizen of Rome to fully understand and solve the mysteries surrounding the city and the Senatus Populusque Romanus (S.P.Q.R. ), or "Senate and People of Rome."